Talking about music/art is like cooking about architecture. It seems that the people who can talk about music very well, usually have an agenda that is self serving. To be rich, famous, adulation of their peers. I seek none of that. I create and share my art because I feel my not doing that would be denying my humanity. My gift to the world. Its like a person having 100 cows and denying their friends and neighbors milk. Now in this capitalist shitstem, the first thing people would look to do is commodify the cows. I purposely distance myself from the commodifying of my art and all the propagandist language one must spew to get people to “buy” it. Let me just say this: When the art has my name on it, it’s honest, it has integrity and it was picture of that point in my consciousness. Now, this is an intense, and ultra-groovy exclusive on Last Day Deaf to welcome the forthcoming weekend by two jazz/fusion “maestros”, Don McKenzie II and Emanuel Ruffler. The thundering drums flirt with a 70’s spaced-out synth similar to the P-Funk style. unleashing an endless groove. Just imagine yourself in a cult Blaxploitation flick with Pam Grier as dance partner. ‘III (Three Sticks)‘ is taken from ‘Sound Art‘ out on Rufftone Records on November 22nd. Brooklyn quintet, On High, are preparing to release a new EP Never Die this April on Rufftone Records. Surviving the Golden Age is excited to premiere their new single “Tragic City.” For those who have not read up on On High, the track may be surprising. It starts with a jazzy instrumental that sounds like it could come from Common‘s Be. When the vocals kick in, they are definitely not Common. It is the voice of Kareem Bunton who you may know from his role as Bo Diddley on HBO’s Vinyl. His booming voice sounds almost professorial; his lyrics poetic and painterly. Just as you get used to his voice, Konstance Patton is added to the mix. Her Roberta Flack-like power gives the track a soulful female voice doubling Bunton’s. 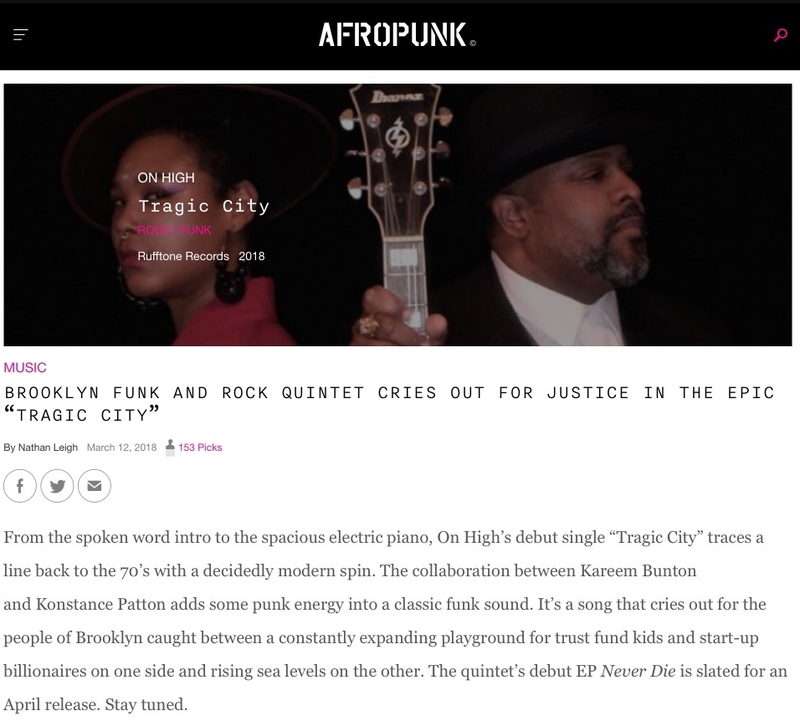 “Tragic City” is a unique combination of spoken word, jazz, soul, and rock, making On High a band impossible pigeonhole. –brings a spontaneous need to chill and listen to something less “aggressive,” but still rocking an alternative vibe. Enter Labyrinth Lounge! 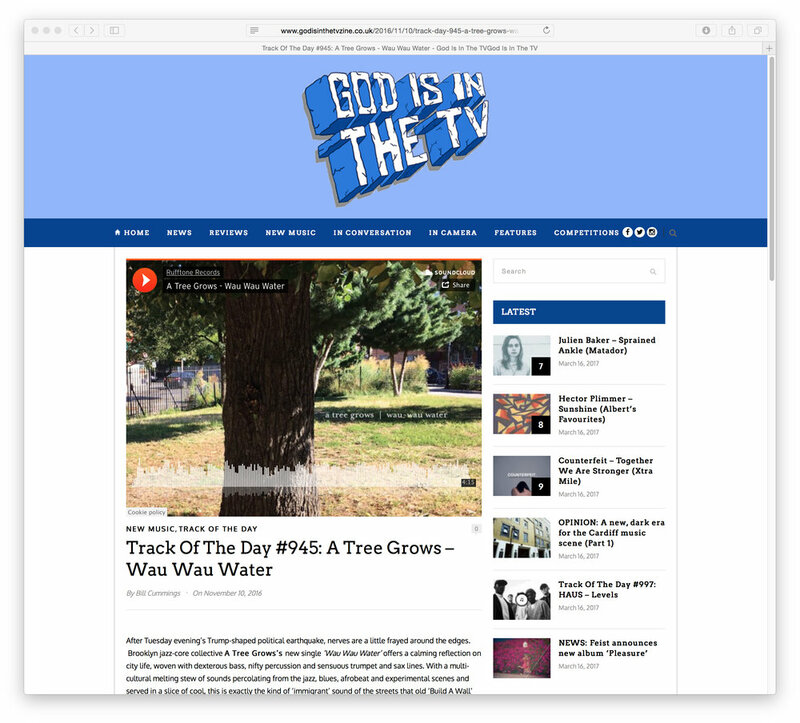 In this day in age, with the immediate availability of cheap flights and ubiquity of the internet, it’s becoming more and more common to see musical groups form over long distances. Today The Big Takeover brings you the premiere of “Trouble Won’t Last” by Labyrinth Lounge, one band who is not letting a few thousand miles stand in the way of making and performing great music. Labyrinth Lounge was conceived and launched in the late ’90s in New York and re-assembled in the Bay Area in 2016. Purveyors of soul and jazz with a vigorous spirit of social activism, they are currently comprised of Valerie Troutt (vocals), Ambessa “the Articulate” Cantave (rap vocals), Emanuel Ruffler (keyboards), John Ormond (bass), and Jaz Sawyer (drums). This is the first single from their forthcoming debut album, called Porgy, to be released via New York’s Rufftone Records. ““Trouble Won’t Last” is a funky soulful laid back approach to Trump’s America. It’s what our grandmothers said when life gave them lemons. It’s a reminder to keep pushing against all odds until you see the outcome you desire,” says vocalist Valerie Troutt. Despite the fact that this is the group’s debut album under this name, the project has a long-running history, carried in the bass and drums of John Ormond and Jaz Sawyer, who are best known as the rhythm section for the late Abbey Lincoln, one of the most outspoken among the great jazz divas, a long-term messenger of black consciousness and political activism in the jazz world. Ormond and Sawyer now carry on this tradition within the framework of today’s sounds, including hip-hop, rock, neo-soul, and spoken word poetry. In the late 1990s, involvement with vocalist Valerie Troutt, Emanuel Ruffler on keyboards, and Ambessa “the Articulate” Cantave has resulted in a unique and hopeful fusion of genres, including jazz, R&B, soul and, experimental music, which they’ve touted throughout clubs and lounges in lower Manhattan, Brooklyn, and New Jersey. The project revived in summer 2016 with the original line-up, but based in East Bay, where Valerie Troutt had since established herself as more than an artist, becoming a leader in the area’s famed creative community. After performing at Oakland’s Studio Grand the band members secluded themselves in California’s Bird and Egg Studio the following day, recording six new tracks. “The inspiration was confronting problems, how to overcome them. I thought of a few dilemmas I was going through at the time and freestyled about the feelings I had,” explains Ambessa Cantave. The single is set to drop on July 21 via all the regular online music stores and streaming platforms, but until then, keep your eye on this playlist, which will build as the label adds track after track. Tantalisingly brief, more an EP than a full album, feel the quality not the width, the New York-based Painting duo of German-born pianist Emanuel Ruffler and Seattle drummer Kassa Overall release their debut Gravity (Rufftone ****) later this summer. Together as a playing entity for three years first performing together, according to their website “at a gig in a Brooklyn bike store,” the wheel turns in more senses than that convenient metaphor here. Ruffler is the kind of player who certainly has appeal to Craig Taborn or Kris Davis fans and Overall plays very free, almost multi-directional at times but often more in a style familiar from Gerald Cleaver’s approach, cascading ever outwards. As a duo a tipping point is quickly reached far beyond sheer musical vocabulary and relies on a no-safety-net sense of free expression. A poem in the artwork gives clues to their inspiration... an earthquake in Japan caused by the meltdown at the Fukushima nuclear reactor, a trembling coastline, radioactive fallout... eventual serenity. We passed this amazing #campingcar and #snapped this #picture here.